Terrific stuff! Keep it up! 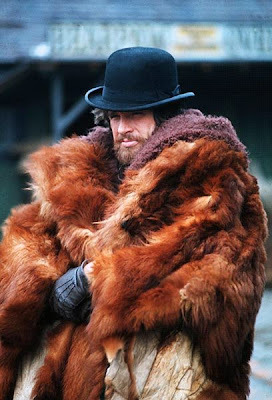 I love MCCABE AND MRS. MILLER for every single reason you mention and more. It is, indeed, the ultimate Altman film in many ways. I'm really getting into the dreamlike atmospheres of IMAGES and THREE WOMEN these days. This is somewhat atypical Altman (especially the petrifying IMAGES), but I think that's why I like it. But is there anything like the building of Presbyterian Church (the name of McCabe's town)? Is there anything like the warm interiors and the cool exteriors mixing. You feel the cold hitting you, and the warmth soothing you again. Beatty and especially Christie are in ultimate form. Beatty's Popeye-like grumbling is esecially inspired. Christie takes ahold of our attention the moent she appears and though her screen time is only a fraction of what you might wish it would be, her performances transfixes me; one of the greatest performances of the decade. Incredible supporting cast in front of and behind the camera including Vilmos Zsigmond, photographer, and song composer Leonard Cohen, whose participation in this film is beyond reproch; it is the essence of perfection, particularly through its memorable opening credits sequence. Brilliant choice by Altman. If you can't tell, I'm a certified Altman fan. Anyway, great overview.